Conjunctivitis, or “pink eye,” a common, treatable eye condition, can be found in children and adults. It affects the conjunctiva, the thin, clear tissue lining the inside of the eyelid. Sufferers complain of redness, pain, itching, or burning. Sometimes there is a discharge during the nighttime hours that causes the lids to “stick shut” the next morning. The name “pink eye” comes from the inflamed blood vessels which give the eye/eyes a pink or red appearance. Cold compresses and over-the-counter artificial tears products can provide relief from symptoms. Individuals with compromised immune systems from cancer treatment, HIV, or other medical condition should schedule a visit with the doctor. Viral and bacterial conjunctivitis are highly contagious. Allergic conjunctivitis is not contagious. Don’t share eye drop dispensers/bottles between the infected and non-infected. Avoid sharing towels, blankets, or pillows. Clean discharge from your eyes several times a day. Ask your eye doctor about cleaning, storing, and disposing of contact lenses and lens solution. Don’t share eyeglasses, eye make-up, or eye makeup brushes. Replace makeup after a bout with conjunctivitis. If you are in doubt about your pink-eye condition, make an appointment with Alpharetta Eye Clinic or Windward Eye Care, your family optometrists. Infectious keratitis can be caused by bacteria, virus, fungi, or parasites. The infectious strain can usually be traced to poor sanitation and handling of contact lenses. Doctors treat these infections with antibacterial eye drops. The experienced doctors at Alpharetta Eye Clinic and Windward Eye Care can help you ease the pain of keratitis and help you avoid it in the future. If you are having severe eye pain and can barely open your eyes, you may have keratitis. Make an appointment to get relief. Eye Infections: Let the professionals at Alpharetta Eye Clinic or Windward Eye Care get to the bottom of it. They will examine you thoroughly, diagnose the problem, and get you on the road to recovery. Good vision is everything. If you or a family member need to get an eye examination, give us a call. 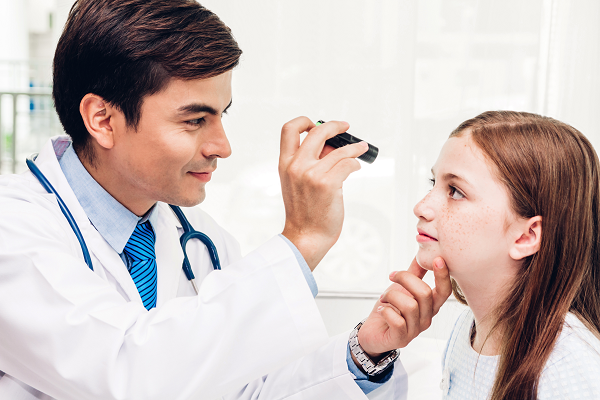 We do pediatric, adult, and senior eye exams as well as diagnose and treat many other common eye conditions.